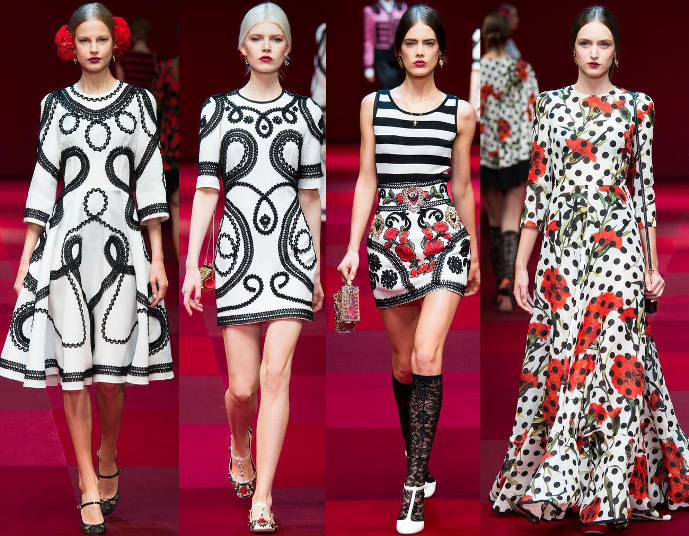 Having trouble keeping up with the runway collections this season? You’re not alone. 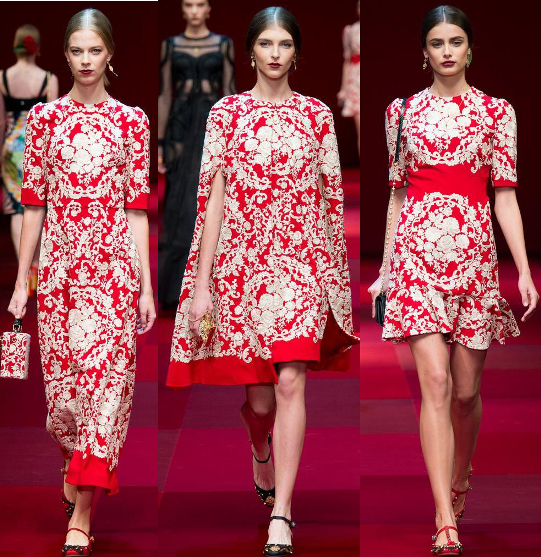 The Spring/Summer 2016 runways of Milan Fashion Week have been collecting dust for days on end for me, which is a big change from how rabidly I’m usually scouring the web for the latest runway shows. 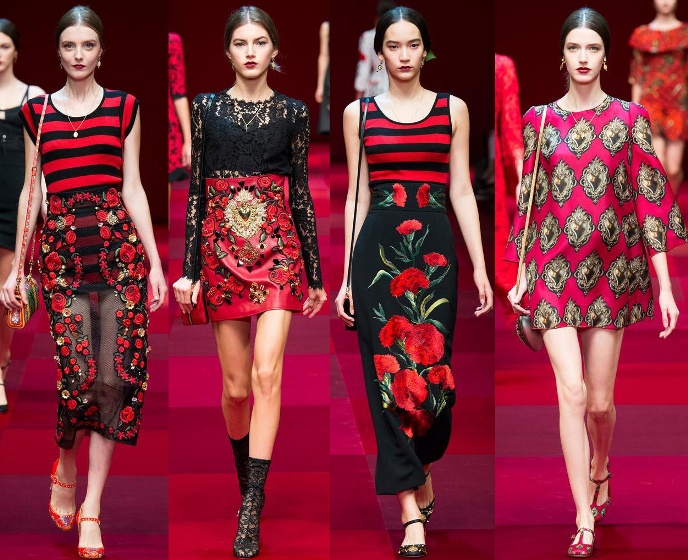 To make everyone’s life a little easier, here’s all the top SS16 looks you need to see! 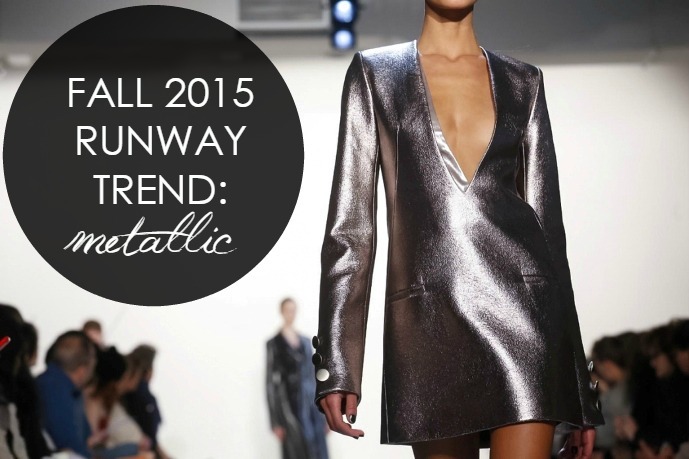 The Fall 2015 Ready-to-Wear runways have shown a significant amount of 70’s boho chic, but it’s another a trend that REALLY caught my eye: metallic. After all, who doesn’t love a little sparkle and shine in their life? Metallic made its first appearance at Misha NoNoo, when the usually minimal aesthetic was injected with metallic blazers and turtlenecks at New York Fashion Week. Then metallic found its way to London for Temperley London and more lately, Blumarine‘s disco ready runway at Milan Fashion Week. 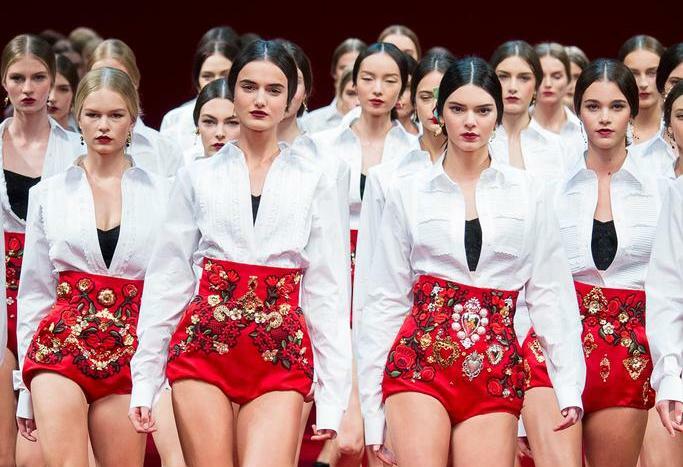 We’re just about two-thirds of our way through Fashion Month and metallic shows NO sign of slowing down. 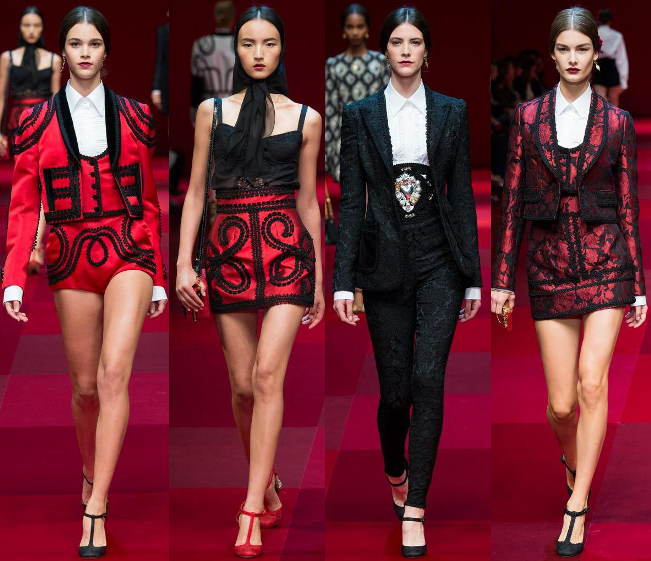 And with Paris Fashion Week yet to come, it’s exciting to think of possibilities from houses like Saint Laurent or Alexander McQueen. Heck, perhaps Karl Lagerfeld at Chanel will add some metallic to the pot! (Come on Karl, do it!) 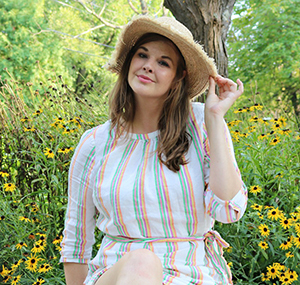 Suffice to say, I’m kind of excited by the prospects for my coming fall wardrobe. 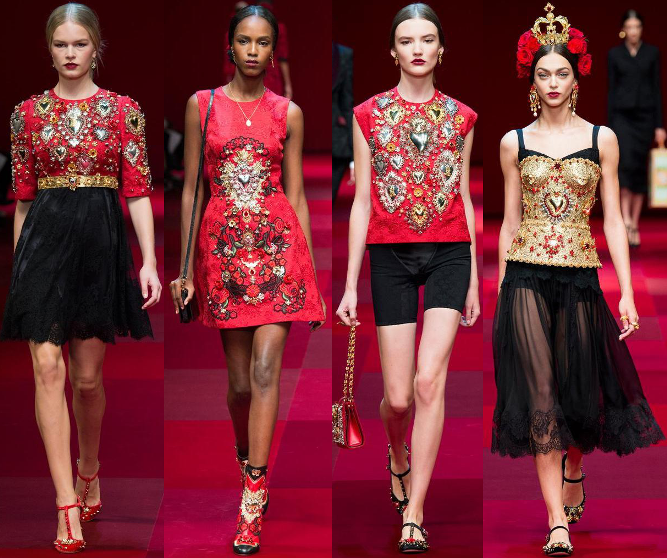 Few designers have the astounding capability to dominate the runways every season, but Domenico Dolce and Stefano Gabbana are definitely of that rare breed. 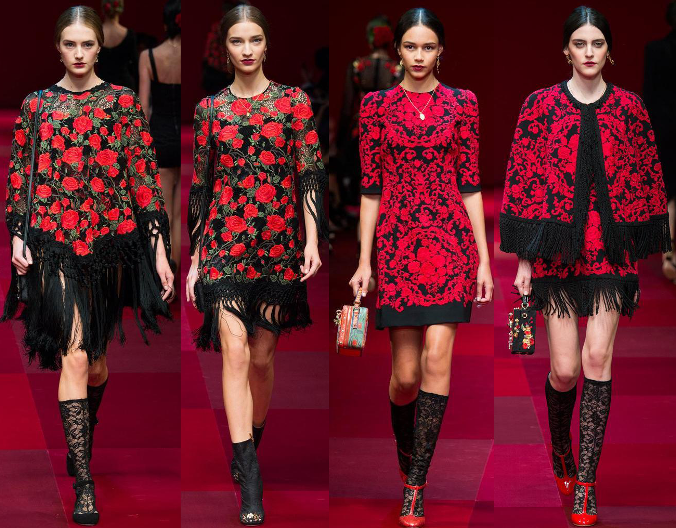 For Dolce and Gabbana‘s runway show this season, we saw an army of Spanish Senoritas tangoing down the runway in a Spanish influenced Spring 2015 Collection. I feel I say this EVERY season, but it was truly a major fashion moment. 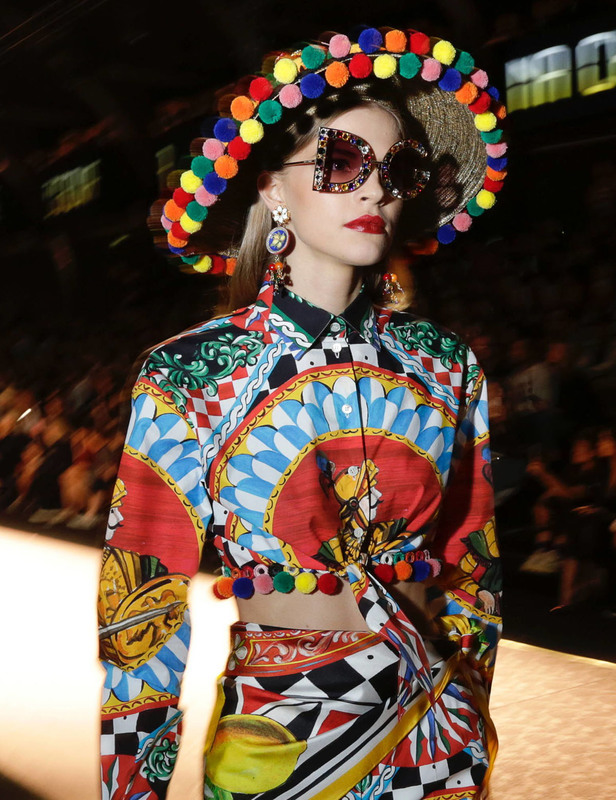 Just how these Italian masterminds are able to outdo themselves again and again, is beyond me – but it’s certainly nice to sit back and salivate over it all. 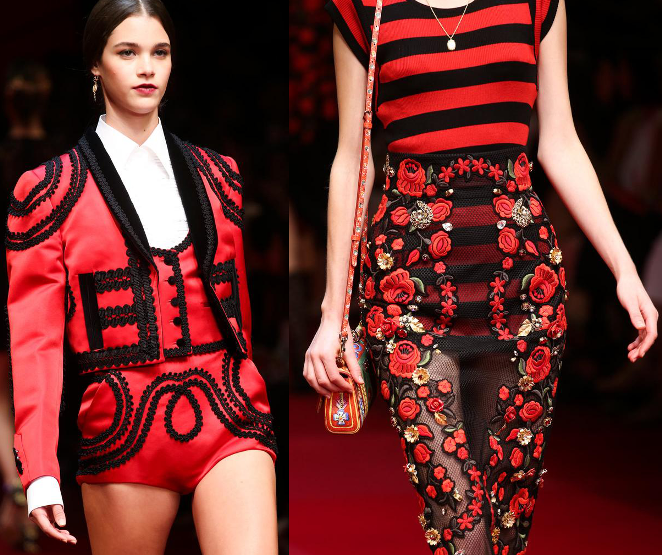 In typical fashion, it was red – ornate – royal…and thoroughly dramatic. 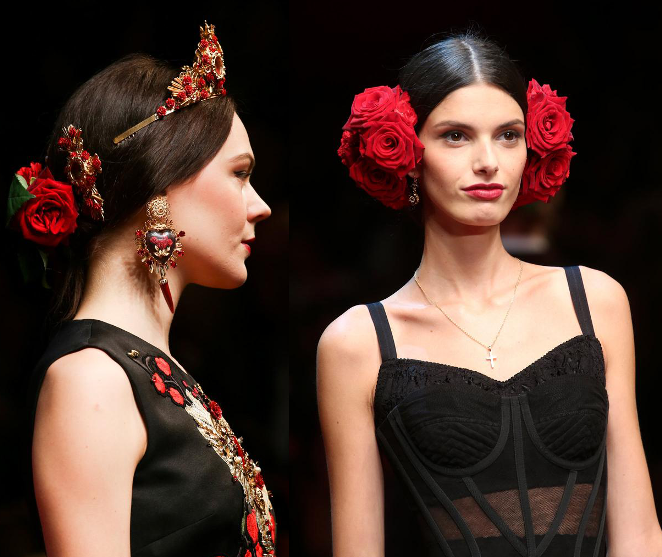 Crimson red, gold and black remained signature colors of the collection, this time influenced by the Spanish rose and matadors. 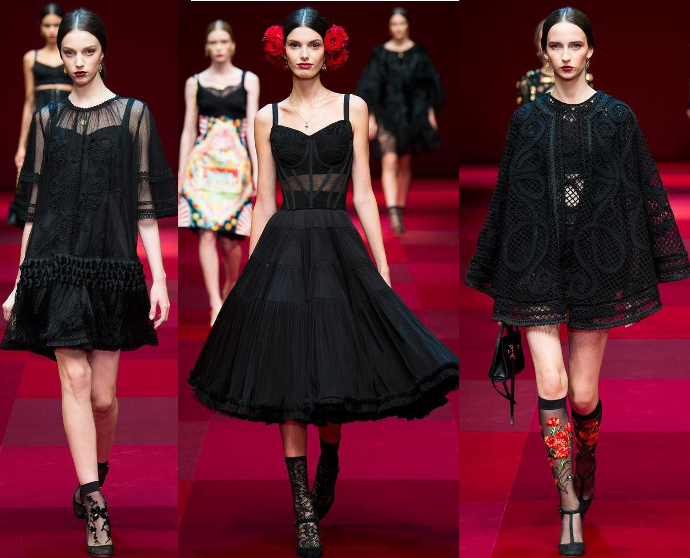 It was a perfect time to showcase the matador coat, with capes being all the rage right now. 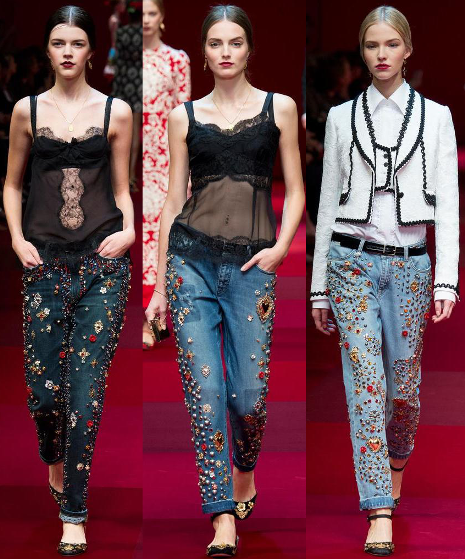 It’s not just a take on the trend, but a defining statement. 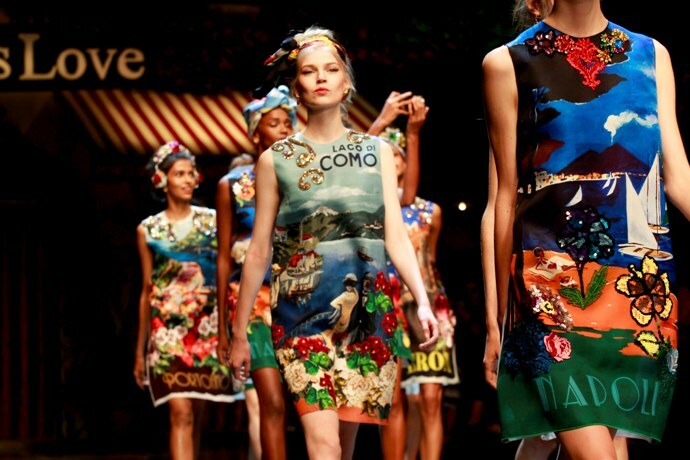 And per usual, the show ended with an army of models. 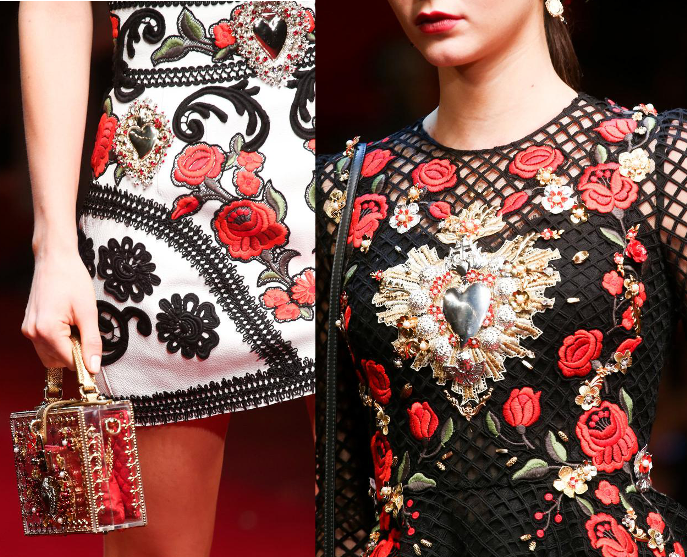 This season, the silver and gold of recent collections were back-burnered for red and white. In case you missed the live-stream of the show, I did find it on YouTube for us all! 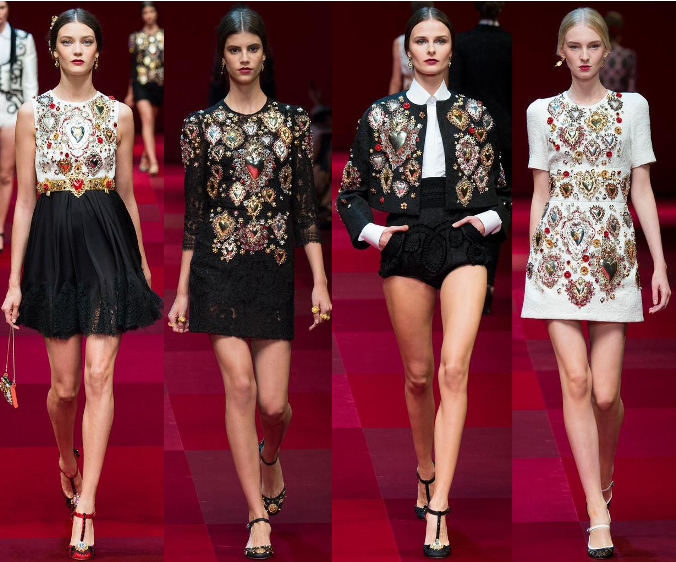 Watch the runway show here! There’s really nothing bad about this collection. No, not even in the slightest. 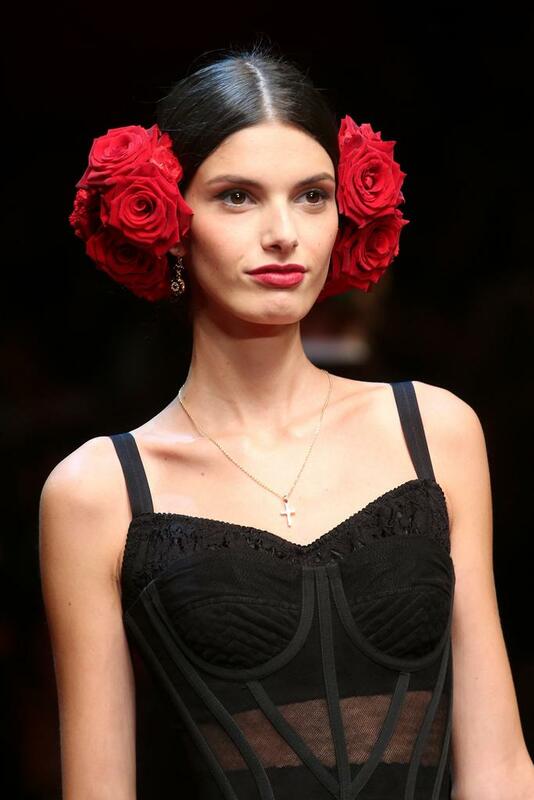 I did think of an additional cool thing D&G could do, which is convert the rose hairpieces into rose-headphones. How chic and adorable would that be? Just picture it! 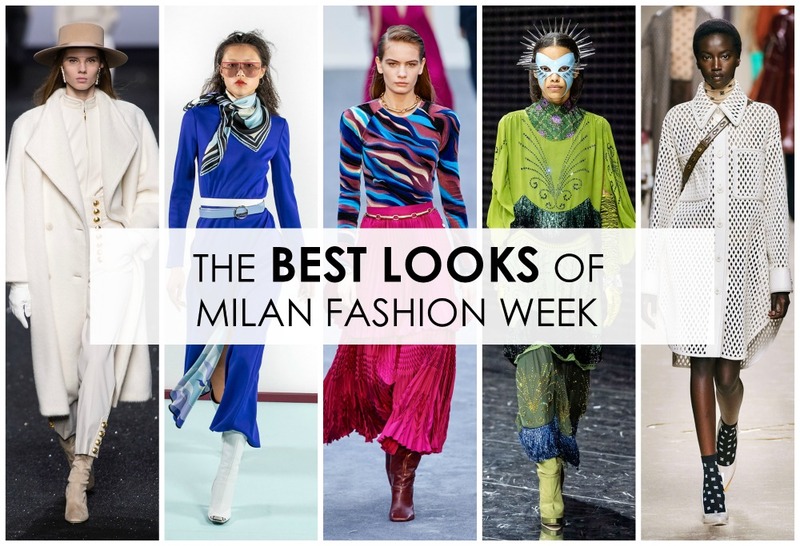 And, if you have missed any of the fashion week coverage here – check out The Fashion Week Directory to get all caught up! That’s it for now dreamers. 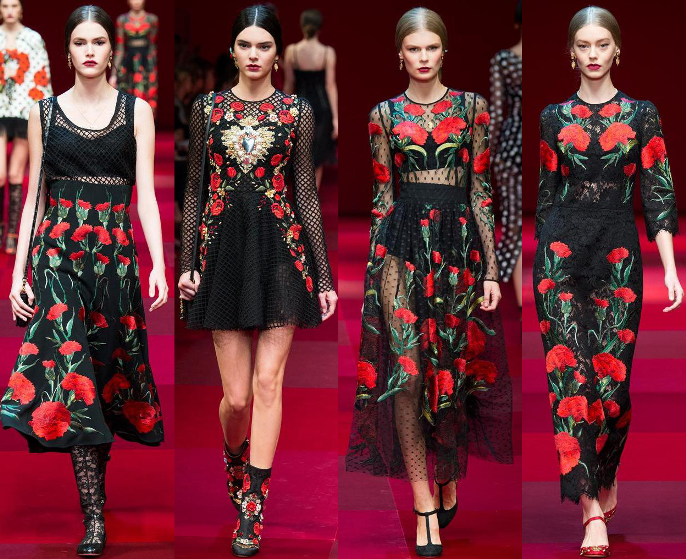 Think of roses tomorrow when getting ready!